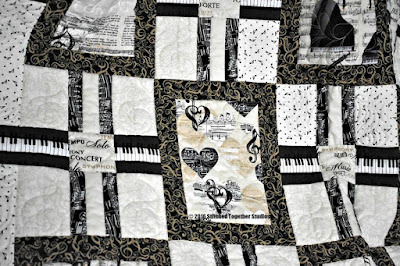 While the word "concerto" technically means a musical composition, after seeing this quilt, also named "Concerto," it's easy to see how the definition could be stretched to a quilt as well. After all, it's a composition, and it's created entirely by musically themed fabrics! Stephanie Sheridan of Stitched Together Studios designed this quilt for Quick Quilts magazine using The Music in Me collection from Kanvas. What attracted you to The Music in Me collection? Music collections are always so much fun to work with and very popular. This is actually my 2nd magazine quilt with a music collection by Kanvas - the first was "Symphony in B" and it was a real hit - I still get requests from quilters looking for the fabrics to make it. I am always attracted to stripes - and I love finding unique ways to use them in a quilt, so my favorite would have to be the Duet Stripe! I fussy cut it for this quilt (it became the vertical sashing) - it looks like a pieced strip, but isn't - total time saver! Did you fussy cut the focal print for the big squares? 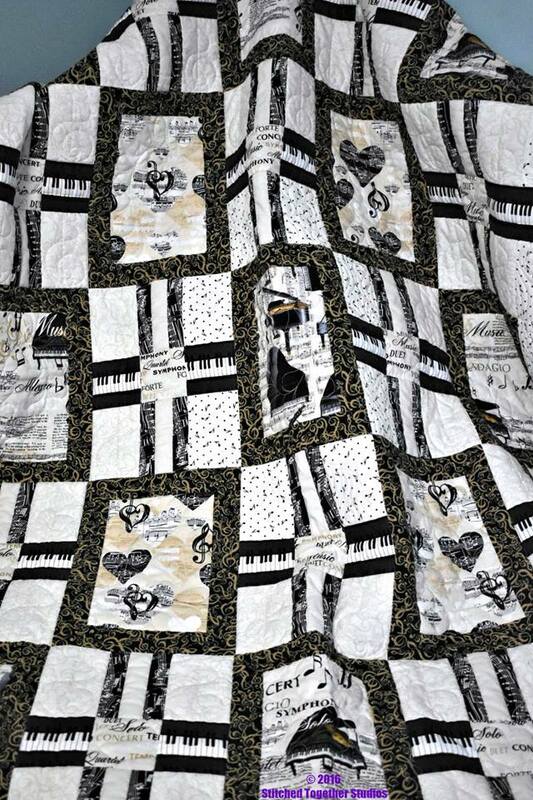 I actually used 3 different focal prints - and I did do a little fussy cutting to have the pianos balanced across the quilt. There is a lot of fussy cutting in this quilt - just take your time with it! How did these fabrics lend themselves so beautifully to a quilt design? 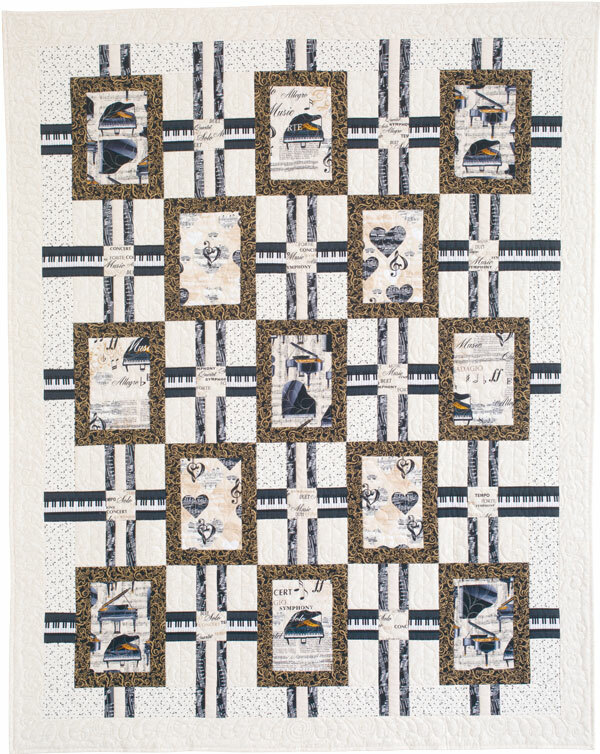 Both the Piano Bar and the Duet Stripe fabrics helped make a more complex looking quilt without additional piecing and created an interesting background grid for the focal fabrics. Any tips for making the quilt? Pay careful attention to the direction of the fabrics! So many of these fabrics are directional, and they will stick out like a sore thumb if they are upside down or sideways! Can you talk about your background print choices, and your decision to use one of the background prints as the outer border? 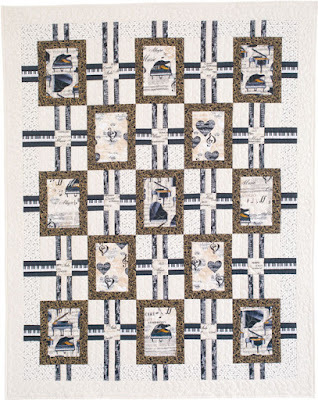 The two different background prints add another layer of subtle dimension to Concerto, and the light border allows the center of the quilt to just float, rather than be anchored down by a heavier dark border. What inspired this quilt design? The fabric line inspired it ... I had kicked around a design like this and when I saw The Music in Me - I knew it was the perfect fabric for the design. 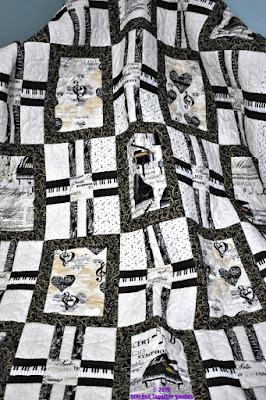 I really love the light and airy quality of this quilt, in spite of the amount of black in the fabrics - I feel like it reflects a soft and quiet type of classical music. Mom really outdid herself on the quilting with this one! 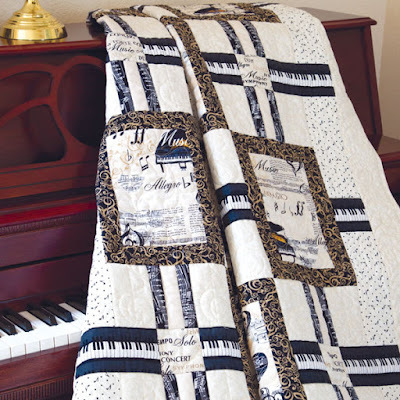 She used more traditional motifs like a feathered oval wreath on the focal squares and a lovely swirl in the border, but then added in some treble clefs and hearts to really accentuate the musical motifs in the fabrics. The magazine even has the quilting motifs drawn out in the pattern section so quilters can get the same look as our quilt. 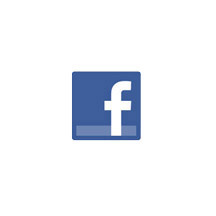 Click here to see the entire The Music in Me collection. 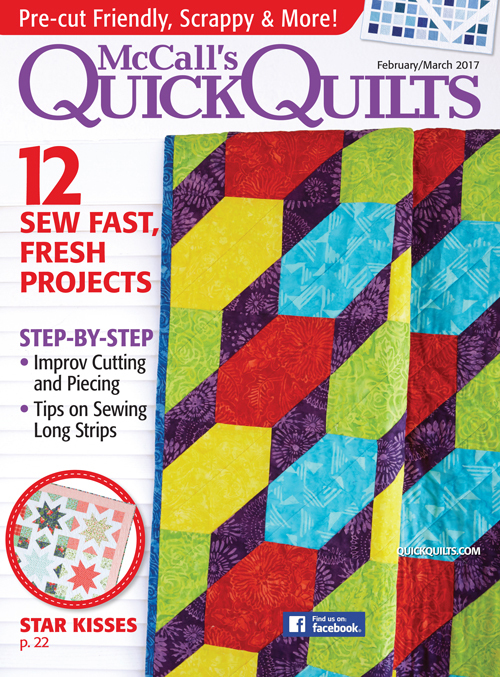 Click here to find McCall's Quick Quilts magazine.